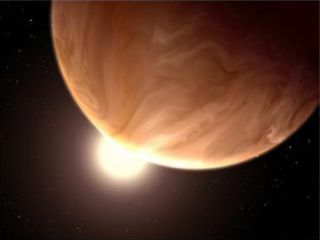 An artist's rendition of a cloudy super-Earth. Scientists suspect that alien life could potentially thrive on an alien planet by subsisting on "supercritical" carbon dioxide instead of water. Alien life might flourish on an exotic kind of carbon dioxide, researchers say. This "supercritical" carbon dioxide, which has features of both liquids and gases, could be key to extraterrestrial organisms much as water is to biology on Earth. Most familiar as a greenhouse gas that traps heat, helping warm the planet, carbon dioxide is exhaled by animals and used by plants in photosynthesis. While it can exist as a solid, liquid and gas, past a critical point of combined temperature and pressure, carbon dioxide can enter a "supercritical" state. Such a supercritical fluid has properties of both liquids and gases. For example, it can dissolve materials like a liquid, but flow like a gas. "I always have been interested in possibly exotic life and creative adaptations of organisms to extreme environments," said study co-author Dirk Schulze-Makuch, an astrobiologist at Washington State University in Pullman. "Supercritical CO2 is often overlooked, so I felt that someone had to put together something on its biological potential." In addition, exotic locales on Earth support the idea that life can survive in environments rich in carbon dioxide. Previous studies showed that microbes can live near pockets of liquid carbon dioxide trapped under Earth's oceans. This liquid carbon dioxide in the seafloor gets denser with greater depth, as the weight of the seas and rock above it increases. As that happens, the fluid could become supercritical, and microbes might use at least some of the biologically advantageous properties of this supercritical carbon dioxide to survive, Schulze-Makuch said. Indeed, there may be many reservoirs of supercritical carbon dioxide under the oceans, he added. "It would be great to drill into areas with supercritical carbon dioxide on Earth and investigate those environments in detail, but this is obviously difficult because of practical limitations and huge expenses," Schulze-Makuch said. An artist's rendition of the surface of Venus with an erupting volcano. Was Venus a supercritical haven? Since carbon dioxide is a very common molecule in planetary atmospheres, the researchers suggest that supercritical carbon dioxide may be present on many worlds. This is especially true for Venus, whose atmosphere is mostly carbon dioxide. In its early history, Venus was located in the sun's habitable zone, the area where liquid water can form on a planet's surface. Life as it is currently known could have developed there before Venus heated up enough to lose all its water. Although Schulze-Makuch said it was unlikely that any such life could have switched from water to supercritical carbon dioxide, perhaps some organic remnants of such life, if it existed, could have been preserved in that fluid. Beyond the solar system, Schulze-Makuch noted that many newfound planets orbiting distant stars are so-called super-Earths, worlds up to 10 or more times the mass of Earth. Under the stronger gravitational pulls and correspondingly higher atmospheric pressures of those planets, supercritical carbon dioxide might be common, he said. Although Schulze-Makuch noted there is no proof that life that does not depend on water is possible, "there are good reasons to hypothesize that this is so," he told Space.com. Schulze-Makuch and his colleague Ned Budisa detailed their findings in the September issue of the journal Life.